Today I am reminded of the beautiful sunny day we experienced on Sunday in Cape Town. It was as if everything around us and everyone became alive, rejuvenated, full of smiles and wonder for the gift of an amazing, outdoor day! The sunlight fills us up, re-energises us and allows us to experience gratitude and fun! The sun brings light in, the sun signifies the start of a new day! The sun fills us with the wonder of life. Have you thought of bringing the “sun” into your daily life challenges? To look up towards the sky, to the sunlight, when all else seems dark? Yes, there are many seasons, storms in winter, flowers in springtime – we journey through them all. There are even times of drought and hardship. Yet, every now and again a beautiful day surprises us and we are filled with hope again. Such is our journey’s, there are many seasons, many cycles, yet, every now and again, a blessing and miracle that brings hope. The secret is this – where do you hold your attention? Can you bring positive energy into winter? Can you make the best of a specific cycle and see the learning and gratitude in it? Can you look up, turn your head towards the sun, turn your heart towards hope and see the wonder beyond it all? 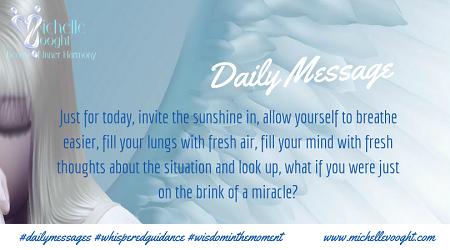 Just for today, invite the sunshine in, allow yourself to breathe easier, fill your lungs with fresh air, fill your mind with fresh thoughts about the situation and look up, what if you were just on the brink of a miracle?